Global Plant growth regulator market is valued $1,550 million in the year 2017 and is expected to grow at a CAGR of 4.6% from 2018 to 2023. The market is growing steadily due to wide adoption of ethylene across groups. Cytokinins is having the highest market share in the year 2017 and is followed by Ethylene which is valued $448.5 million and $386.2 million respectively in the year 2017 and is anticipated to grow with a CAGR of 4.6% and 5.9% from the year 2018 to 2023. What is plant growth regulator? Plant growth regulators are the synthetic or natural chemicals that are responsible in controlling the growth and development of the plant. Natural plant growth regulators are produced with in specific parts of plants in minimal qualities and migrate to other parts, manipulating several physiological functions to regulate the plant’s growth such as promoting plant cell division and cell expansion, leaf expansion, retarding senescence of the leaves, ripening of fruits & vegetables, fruit & flower maturation, and seed germination. The major types of plant growth regulators are cytokinins, auxins, gibberellins, ethylene and abscisic acid. What are the major applications for Plant growth regulator? The various end users assessed include fruits & vegetables, turf & ornamental, cereals & grains, oil & seeds, and others. The major fruits that utilize PGR are apples, banana, grapes, mango, litchi, water melon, pine apple, kiwi and others. Vegetables like cucumber, lettuce, spinach, cabbage, pumpkin and others use these plant growth regulators. The main objective for the application of PGR in fruits and vegetables is to support their ripening. This is achieved by ethylene which is also called as ripening hormone. The turf and ornamentals segments comprises of turf grass, nursery plants, ornamental plants, ornamental flowers, woody ornamentals, bedding plants, green house plants and others. In lawn and turf grass management, PGRs have applications in initiating and maintaining turf growth, preventing change in the color of the grass during conditions of cold stress, reducing mowing frequency, increasing plant thickness and limiting vegetative growth there by improving the quality of turf. RIO, which is developed from natural plant sources, boosts natural plant hormone activity and allows plants to develop more effectively. Environmental Protection Agency has recently approved this bio stimulant from Arysta Life Science, North America which activates endogenous natural plant hormone activity for enhanced plant reproductive growth. Companies into the manufacturing of PGRs are continuously looking for versatile solutions. One such versatile plant growth regulator is Ethrel. It improves coloration and accelerates uniform ripening of fruits. Moreover it can also applicable for specific uses that include defoliation in pomegranate and breaking alternate bearing in mango, etc. 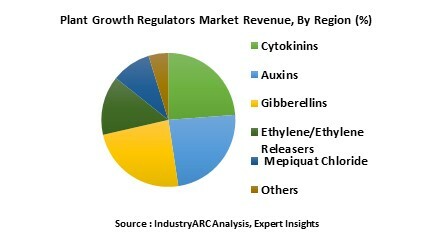 Who are the Major Players in Plant growth regulators Market? The companies referred in the market research report include the BASF, DOW Chemical, FMC Corporation, Nufarm, Syngenta and others.